I don’t eat out at fast food places as much as I should. It is an odd statement, but I should write about their specials more here at Foodstuff Finds, but find myself rarely visiting them. In fact it takes a special occasion to get me into a fast food restaurant, Christmas holidays, birthday or this time an easter bank holiday. I may not have been to a KFC for a while but I haven’t failed to see their adverts for their new Dare Devil bites. Not only that but several people had mentioned the adverts to me and asked me if I’d tried them yet, so I thought I’d give them a go. They are clearly the ‘hot’ item at the minute, pun intended! So we wandered we into KFC and queued in the surprisingly slow queue for ‘fast food’ and I asked for all three new flavours of Dare Devils bites. I’ve seen the hype, I was ready to work my way through the flavours and test my taste buds, I wasn’t quite ready for the hair cut from the advert, but heck bring everything else on. “We’ve sold out” came the reply, “except for the Sweet Chilli” flavour. “Oh, I guess I’ll try that one then” I said disappointedly. Wow, that was poor going for a bank holiday from KFC. Not as bad a snow filled birthday of mine just over a year back when Spectre found that our local KFC had sold out of chicken entirely, as they hadn’t a delivery! Still it is poor stock management to not have all flavours of the item being pushed liked crazy on TV adverts. Anyway I received a tub of Sweet Chilli Dare Devil Bites, which is essentially four small bits of chicken in a tub in a red sauce. Don’t worry I had a two piece variety meal to go with it, I was making the most of my rare trip to KFC! 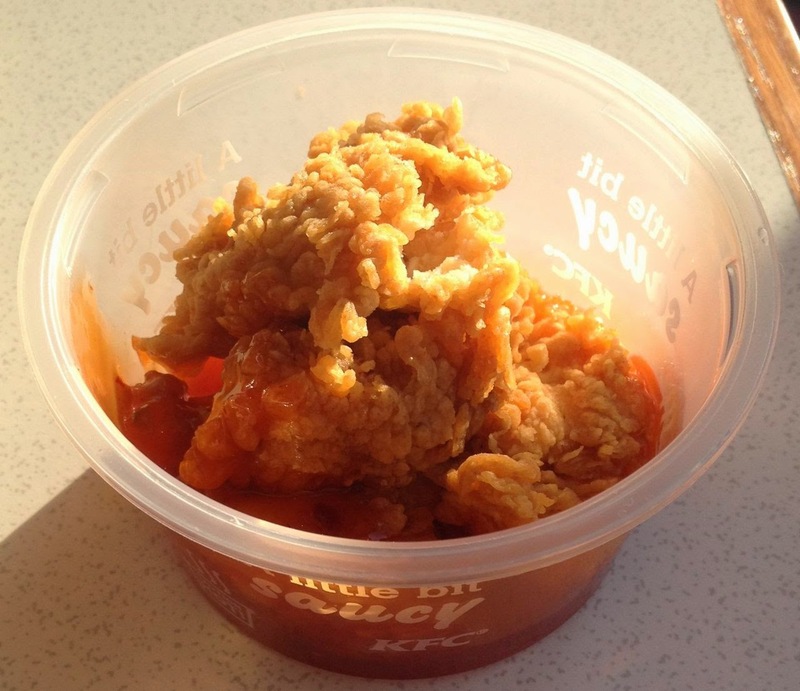 The bites had to be carefully removed from the tub with fingers, so as not to cover yourself in the red sauce. Yes they do have plastic sporks somewhere, but where is the fun in that? The flavour didn’t require any dare devil at all, it was flavoursome and more like a sweet and sour sauce than a chilli sauce. There was a gentle mild hint of warmth from some chilli, but nothing that would offend anyone. It was pleasingly sweet and tangy. We all enjoyed them very much and felt a little sad at not being able to try all the other flavours. Still the variety meals were fab, and having them again was a proper treat. After we finished our meals we thought we’d console ourselves with some ice cream. I noticed that since my last visit to a KFC they have added ‘Kreme Balls’ to the menu, they looked similar to the previous ice creams only this time with the sprinkles underneath. I queued again to order a round of Kreme Balls and when I finally got to the front the lady said “We’ve sold out, we don’t have any ice cream at all”. Wow KFC, way to go with your stock planning on a sunny bank holiday.